It's almost time to begin our new school year, and for us that means a bit more time on the road. We live in a rather remote area deep in the woods. Routine outings quickly become full-day adventures. Dentist checkups, vision checkups and choosing new glasses, school supplies...the list keeps growing. In part because of our extra drive time, our audio books are listened to and enjoyed again and again. Our audio library recently expanded with another exciting adventure from G. A. Henty's books, The Dragon and The Raven. His timeless tales are retold by Heirloom Audio in just the way to appeal to our family. Let me backtrack just a little. I can't remember who first recommended Henty's books, but I saw the recommendation enough that I invested in a library of his stories, beautifully bound. I even got an additional guide for reading his books with boys. I found the ones that went with our history lesson and attempted to integrate them as read alouds with our schoolwork. It didn't work with the books (I fell asleep!) But the CDs from Heirloom Audio have completely changed that. Our whole family enjoys listening to these stories that almost sound like movies. Have you had the opportunity to listen to any of these? I hope these top-notch productions continue until they share all of Henty's stories. The stories bring history to life, but the addition of features in the audio dramas: sound effects, actors with their expressive voices, a picture is painted that makes it become living history. Study guides are included with each one, too, to help make history even more engaging. 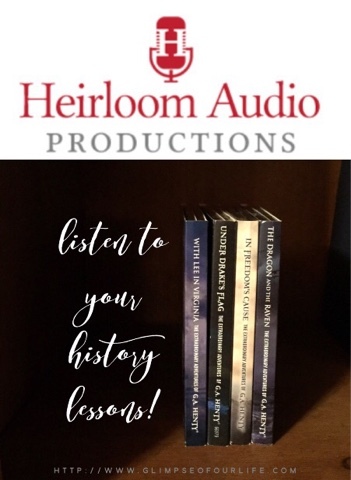 Heirloom Audio is a Christian family company that creates Audio Adventures for Homeschool families. These adventures are fast moving audio dramas designed to teach Christian history in a very fun and engaging way. Heid has several former Adventures In Odyssey producers and sound designers working on the Heirloom team as well as actors including Kirk Cameron. He’s passionate about achieving excellence in the story telling aspect as well as having great production values. The results so far have received a lot of exciting reviews from homeschool families across the country. Heirloom Audio aspires to very high quality standards coupled with a strong and distinctly Christian world and life view. All of the G.A Henty audio books are exciting and filled with adventure. What I like most about the stories is how each of the characters grow closer to God. Also they learn how important it is to forgive their enemies. Even though what has been done seems so unforgivable they share Gods grace. Her big sister shared: "I really like how realistic each story seems. 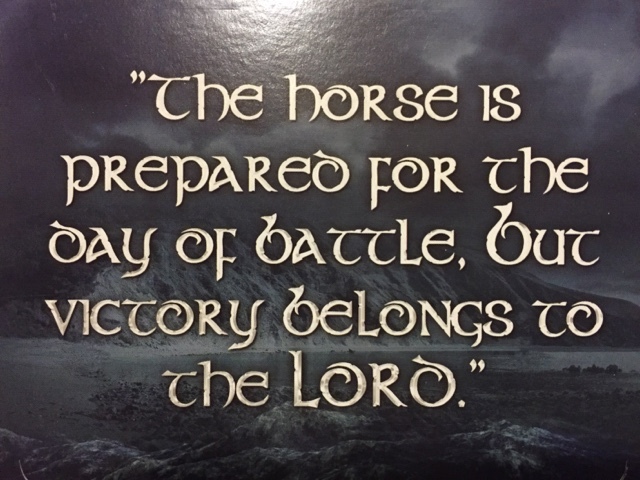 Every scene is described vividly, with dramatic music and special features. We like to listen to audio dramas during long car rides. With car speakers all around you, it is easy to imagine that you are in the midst of a battle or sneaking through the woods." 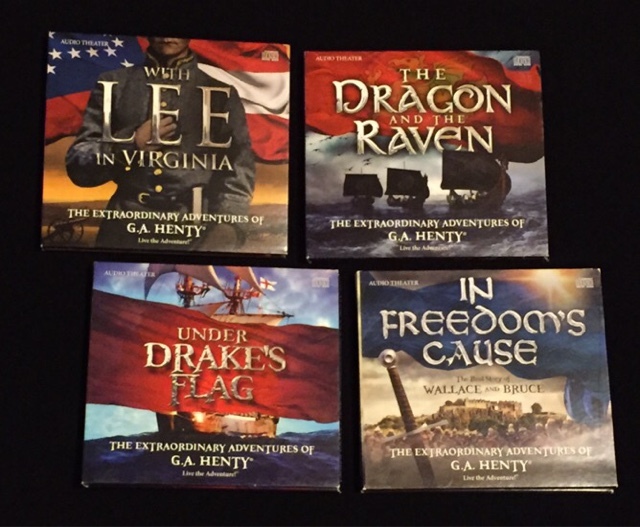 My twelve year old son declares "The G.A henty audio books are a great thing to listen to on car trip and they are very fun. The stories are very exciting and they keep me listening." Which Heirloom Audio drama do you want to listen to first? Purchases can be made at their website. Disclosure: This is a sponsored post by Heirloom Audio. All opinions shared are that of myself and my family. Thanks for your review of these! I'll definitely be thinking of them for grandchildren. I the graphics are beautifully done. They would make a great gift. They are beautiful graphics and links are shared to download and print many. My husband and I love listening to audio dramas. And we're looking forward to introducing them to our kids when they get older. Thanks for the recommendation! You are welcome! I hope you enjoy these as much as we do. What a fantastic idea to play audiobooks on long car rides! Why in the world have I never thought of this? Sheer genius!